George, 32, well groomed hands, neat beard, nice watch, runs Icon Hair, with his brother and sister. 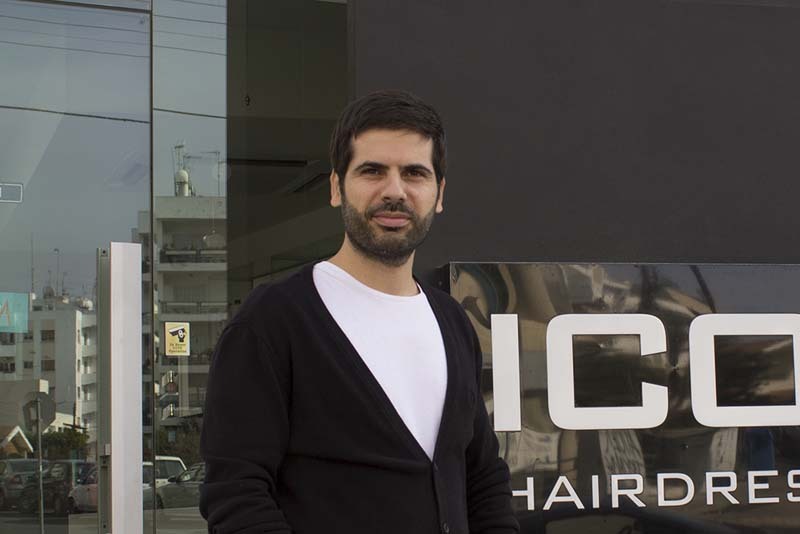 ‘My father started the business, he was a barber, only cutting men’s hair.’ Now 14 people work for Icon. ‘Now you’re a hair architect’! ‘The government doesn’t help at all. The only thing it does is raise taxes. They make the process of hiring and firing staff extremely difficult. You know, my family are religious people, we are trying to be good employers, we treat our people right, we’re honest and we pay very well. We haven’t lowered the salaries the past two years, during the crisis. But the government should do more in return. They could offer free seminars, could help to improve productivity.’ George is angry, he even raises his voice somewhat. We doubled in size over the past 5 years. But compared to last year we’re 12% down. Not a tragedy, we can handle that. I managed keep the clients from running to cheaper salons. He shows me a magazine, the cover styled like a Mondrian-painting. What about the EU? I hear a lot of Cypriot criticism about the way they dealt with your crisis.